Cars would be banned from parts of the Liffey Quays under plans to facilitate a continuous cycle path along the river from Heuston Station to Dublin docks. Dublin City Council is proposing to permanently ban private cars and lorries from Ellis and Arran quays, on the north side of the Liffey, and to divert traffic for 1.5km through the residential streets of Stoneybatter and Smithfield. 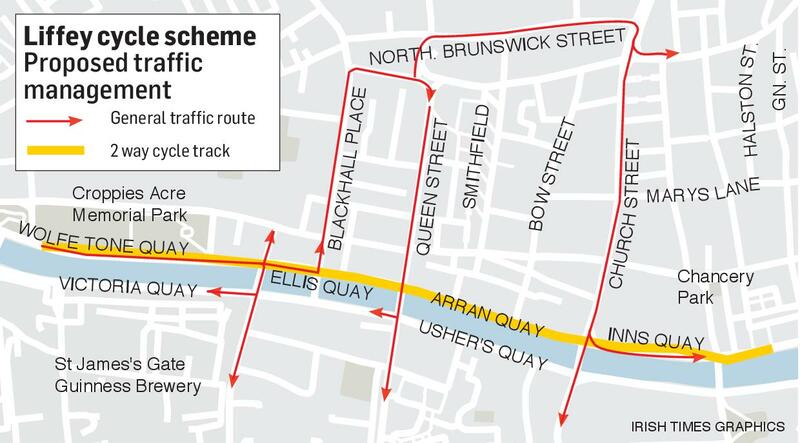 The north quays between Blackhall Place and Church Street would be reserved for cyclists and public transport vehicles, under the biggest changes to Liffey quays traffic yet proposed by the council. The council has been trying to develop a segregated cycle route along the river since 2012, but the plan has hit several stumbling blocks associated with the narrow width of parts of the quays. The council had considered putting the cycle path on a board walk over the river, but discarded this option because of the need to cut into the stone of historic bridges. Last year it planned moving Croppies Acre Memorial Park down to the quay wall, and running the cycle path through the park and then east along the river. This involved diverting buses along Benburb Street, and through an apartment block which was under construction in Smithfield, but had been overlooked in the route selection process. The apartments have since been completed. Last May, the council decided to move the cycle path away from the river into back streets for the first quarter of the route from Croppies Acres until Church Street where cyclists would rejoin the quays. However, in a report to be presented to councillors today, the council’s transport department said there had been considerable disappointment at the loss of this “iconic route along the river” and that a “key stakeholder” the Dublin Cycling Campaign has said they “would not be able to support the scheme as proposed”. The council has since May reviewed all options and decided the cycle route should stay along the Liffey, with all general traffic heading into the city centre having to divert onto Blackhall Place at James Joyce Bridge, before turning right onto North King Street and North Brunswick Street and right again to Church Street to rejoin the quays – a journey of 1.5km. Cars would still be allowed use Queen Street, but only to Cross the Liffey and not rejoin the north quays, which would have one public transport lane and one cycle lane between Blackhall Place and Church Street. Dublin City Council chief executive Owen Keegan in June 2014 had said the proposed Liffey cycle route would reduce the space for general traffic on the north quays from two lanes to one. This was met with opposition from some motorists and city centre retailers who said it would worsen daily gridlock along the quays, particularly during morning rush hour. Following opposition at that time the council had discounted routes that involved reducing space for motorists on the quays.